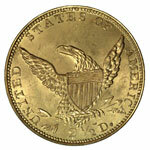 The Classic Head quarter eagle (1834-39) was the first coin of this denomination to circulate in large numbers. New legislation passed by Congress in 1834 altered the standards for United States gold coins, lowering their weight to a realistic level and permitting them to circulate freely and not be hoarded for their bullion value. 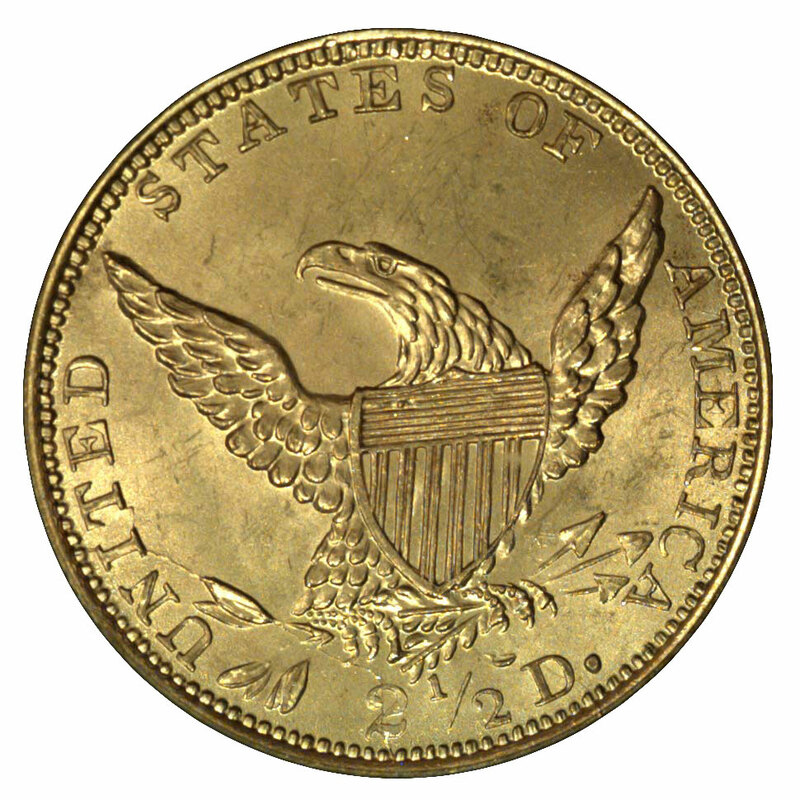 The basic design of the preceding Capped Head Liberty quarter eagle was retained, though it was altered by removal of Liberty's cap and the motto E PLURIBUS UNUM. These changes, plus a slightly smaller diameter for both the quarter and half eagles, readily distinguished the new coins from the old. 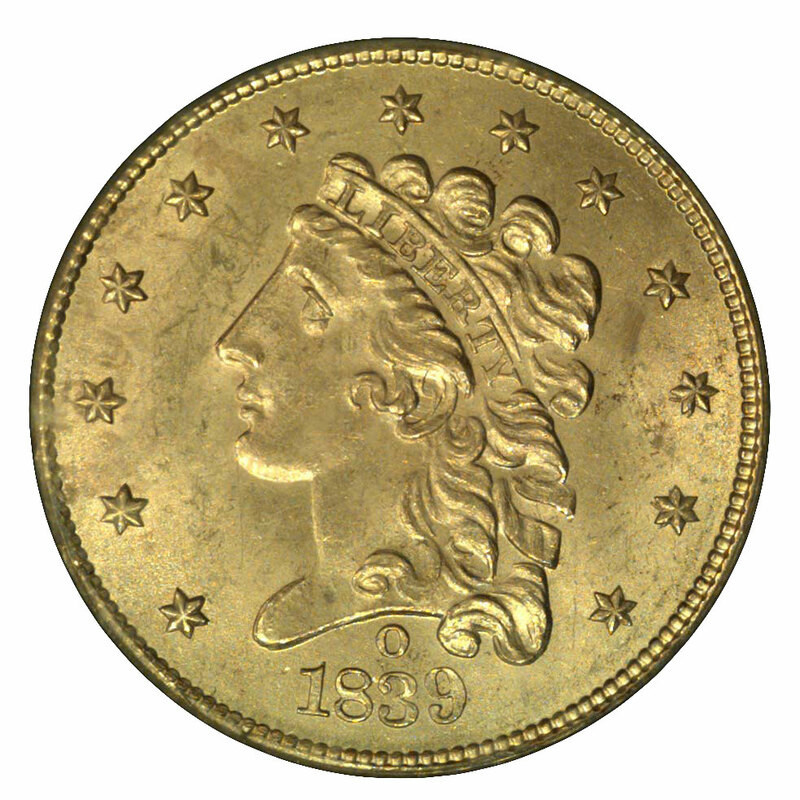 The usefulness of gold coins that actually remained in circulation was such that fairly large numbers were coined over the next few years. Assisting in this extensive coinage were two timely developments — the repayment by France in gold of a debt dating from the Napoleonic Era, and the first fruits of America's domestic gold mines in Georgia and the Carolinas. In fact, it was this newly-mined bullion which led to the establishment of federal branch mints at Dahlonega, Georgia and Charlotte, North Carolina in 1835. These mints coined gold pieces exclusively until closed by the Civil War in 1861. Classic Head quarter eagles survive more or less in proportion to their respective mintages, but the vast majority of extant pieces are circulated to some degree. Most ones seen grade from Fine to Very Fine and have been cleaned at some time in their history. Depending on the harshness of this cleaning, such coins may not be acceptable for certification by third-party grading services such as NGC. This applies also to coins which have been damaged. Because Classic Head quarter eagles were actually used in daily circulation, they're often found with dents and scratches. 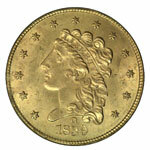 Again, the severity of such flaws will determine whether a coin is acceptable for third-party grading. The biggest variable in grading these coins is their sharpness of strike. This type is noted for being indistinct at its centers, and this is particularly noticeable at and directly above Liberty's ear. The book The Official American Numismatic Association Grading Standards for United States Coins addresses this issue, noting that “Pieces dated 1836 and 1837 are softly struck at the center, and except for 1838 and 1839, earlier dates are almost never well struck up in the hair curls.” Armed with this information, you'll find that grading these coins with this book is simple. The illustrations and descriptions are quite straightforward. Mint state examples of the Classic Head type are somewhat scarce and are concentrated mostly in just two dates, 1834 and 1836. Gem specimens of any date in this series are very rare. Most collectors will have to settle for a coin grading MS-63 or lower, as the supply of superior pieces is so very limited. Among the relatively small population of mint state specimens, there is some variation in surface quality. Semi-prooflike coins may be found for the more available dates such as 1834, but most ones seen have frosty surfaces. Examples that have not been cleaned will typically show a bit of orange or russet toning around their peripheries, and this can be quite attractive. The branch mint coins are generally not as well made as their Philadelphia Mint counterparts, but the southern mints were turning out better gold coins at this time than they would a couple decades later. It's mostly their low mintages that account for the small population of choice pieces. While the typical collector is seeking only a single piece to represent the Classic Head quarter eagle type, collecting this series by date and mint is feasible, if one is not too fussy about condition. A few specialists have even begun assembling these coins by varieties, continuing the work started by the late Walter Breen decades ago.